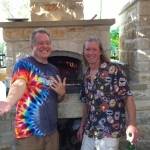 Texas Oven Co. Low and Slow — Your Oven as a Smoker - Texas Oven Co. Remember the haunting tune “summertime, and the living is easy”? As the temperatures go up, I’m happy to find easy dinners that don’t require standing over a hot stove top. Low and slow cooking delivers. Of course cooking in an outdoor wood-fired oven keeps the heat out of the house, but at this time of year I’m happy to break out the slow cooker or turn to wood-fired meals that cook low and slow with minimal intervention. 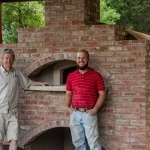 A wood-fired oven retains heat for long periods of time—making it a perfect environment for overnight low and slow cooking at low temperatures. It replicates the kind of cooking coming forward from immigrant traditions, low and gentle cooking to tenderize inexpensive cuts of meat. 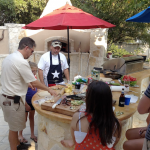 Texans might be more passionate about good brisket than football. Any reference to barbecue and you’re likely to hear opinions on everything from the best BBQ joints across the state, to smoker construction technique, types of hardwood, ideal temperature and time ratios, final temperature, slice-ability vs falling-apart texture, too much or too little smoke flavor, cases for an against seasonings other than salt, not to mention the type and amount of salt. The list goes on but everyone agrees on low and slow. This blog is not about how to take on Franklin or Black’s. There’s a reason those guys have elaborate smokers and fanatical attention to detail for perfect low and slow smoking. 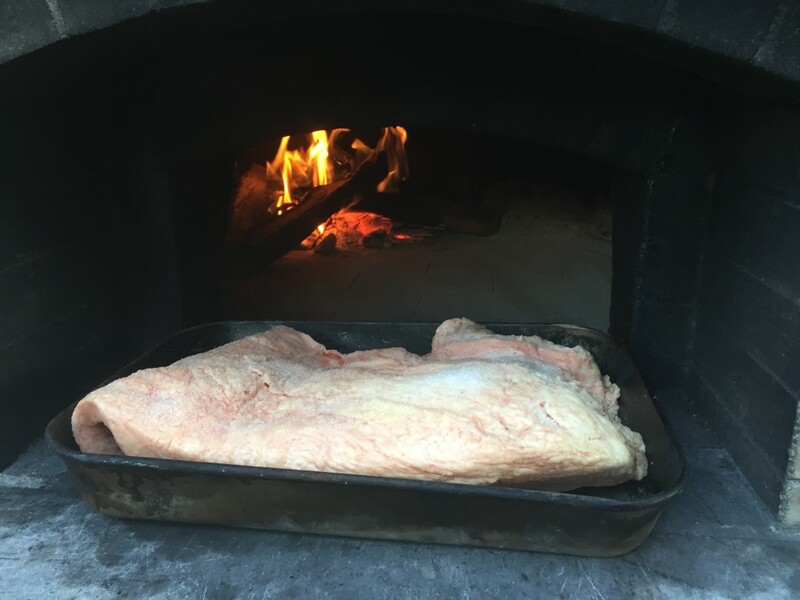 This blog is about how to make fantastic smoked brisket in your wood-fired oven, without sweating over a fire or waking up in the wee hours to add fuel or rotate your meat. 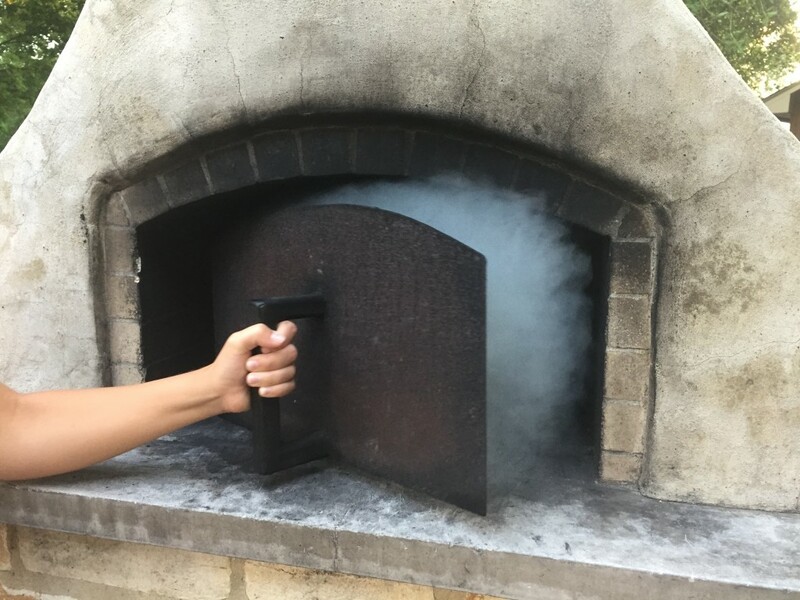 I created smoke, let some escape, then closed the door, sealing the brisket inside with just a little flavorful smoke in the environment. 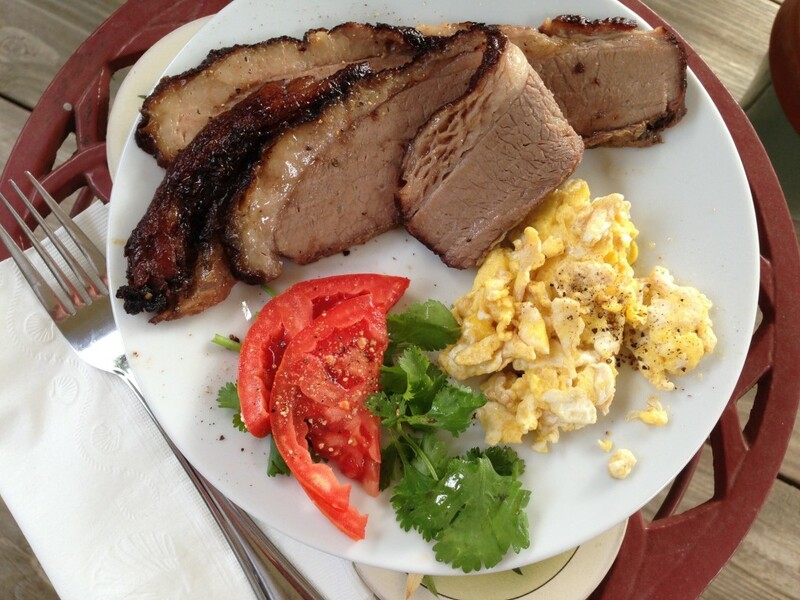 The meat picked up a bit of smokiness and got rave reviews from the folks who had brisket for breakfast. What is it about smoked foods that grabs out attention? When we smell the short ribs cooking on the neighbor’s grill, what triggers that instant “mmm, that would taste so good” reaction? The smell of smoke wafting from food cooked over wood stimulates the olfactory portion of our brains. The olfactory area is also associated with memory and emotion, and that’s why aromas can bring back memories. The flavor of food is a function of its taste, texture, and smell. 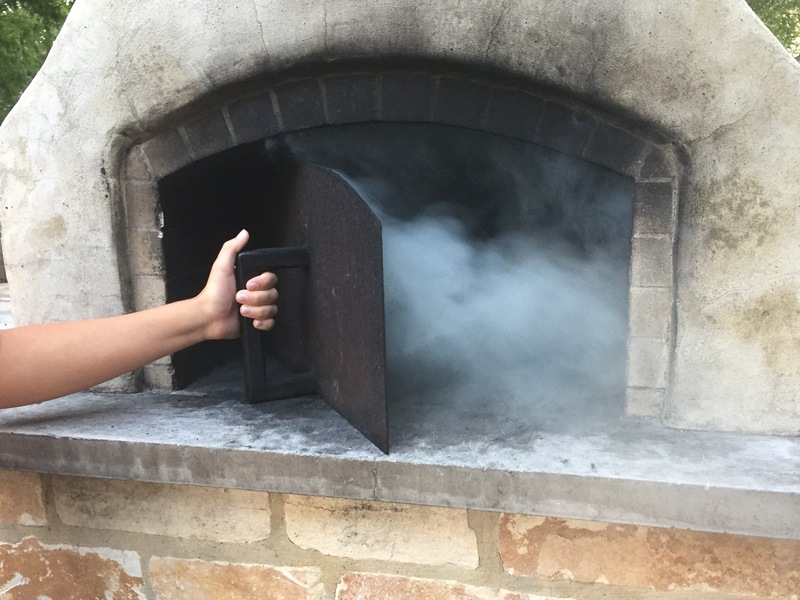 When we talk about the affect of wood smoke on the flavor of food, it’s about smell and taste. “Most of the flavor of smoke is smell,” says Marcia Pelchat, a sensory scientist at the Monell Chemical Senses Center. Smoke is made up of gases, water vapor and small particles resulting from combustion. It contains chemicals from cellulose and lignin, the primary constituents of wood, which break down into other compounds that we detect as aromas. The components of wood cells are sugar molecules that caramelize when burned. The aromatic compounds released by burning hardwood improve the flavor of what’s cooked over it–which the human brain discerns through its sensory network. Because the aromatic compounds released by burning wood are so important to flavor, make sure to build your fires from properly seasoned hardwood (oak, mesquite, hickory, fruit woods) and not softwood like pine, fir, cedar. Softwoods can give food a resinous taste. 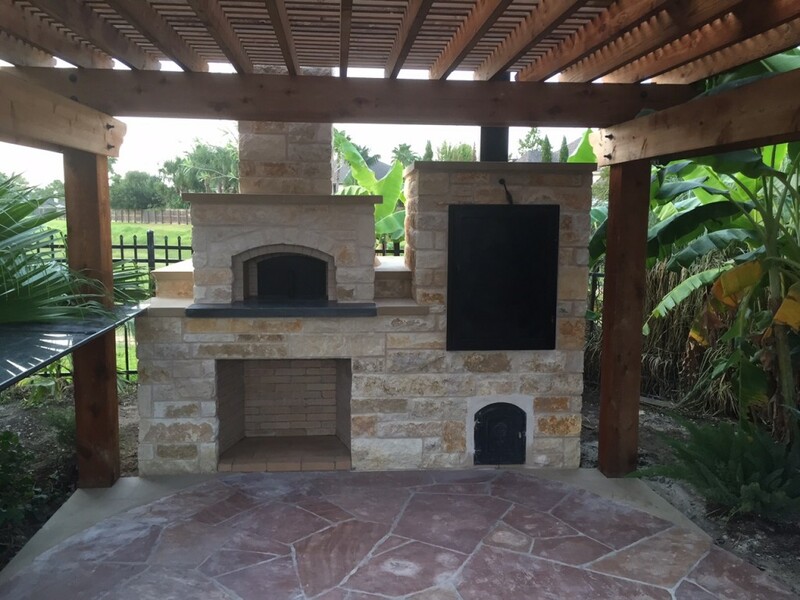 At Texas Oven we specialize in wood-fired ovens and other appliances (fireplaces, Argentina grills, smokers, mobile ovens). 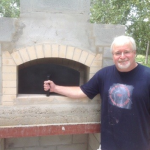 Dave has built a number of smokers over the years in his interest in practicing some of the old ways of food preparation and preservation. For the dedicated smoked-BBQ enthusiast, nothing beats a legitimate smoker. 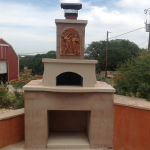 We’ve done many different styles including some built into the base of an oven. 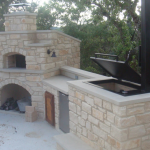 Right now, we’re loving the vertical smokers like the one we did here next to a wood-burning oven in the Houston area. 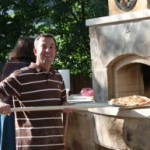 Of course, this whole enterprise started out with a passion for wood-burning ovens, the ultimate multi-tasking appliance. 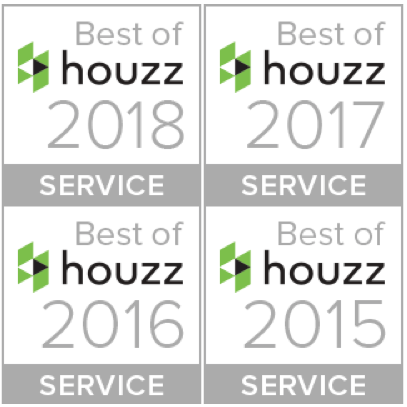 Usually associated with blistering heat and pizza, these ovens are just as impressive as low and slow cooking appliances. 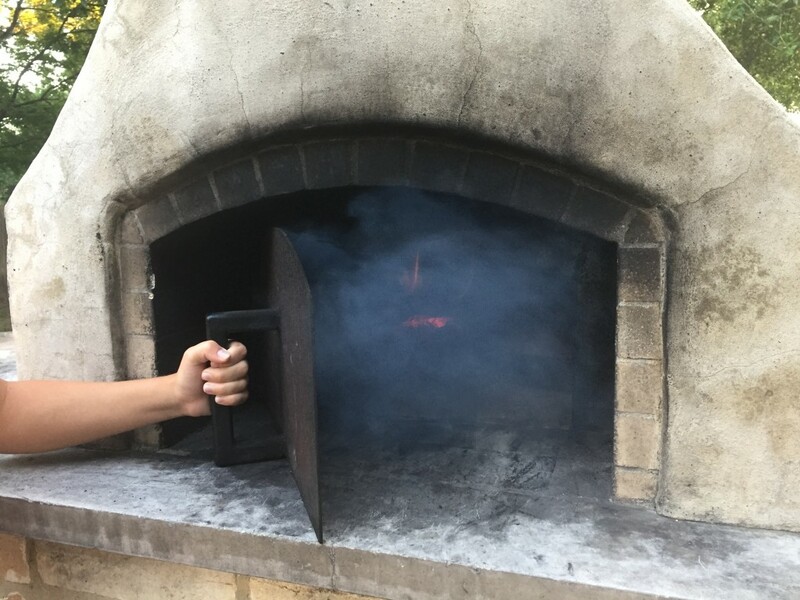 We believe a wood-fired oven works as an effective smoker. 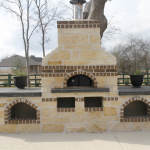 If you’re choosing only one wood-fired appliance, the oven does it all. 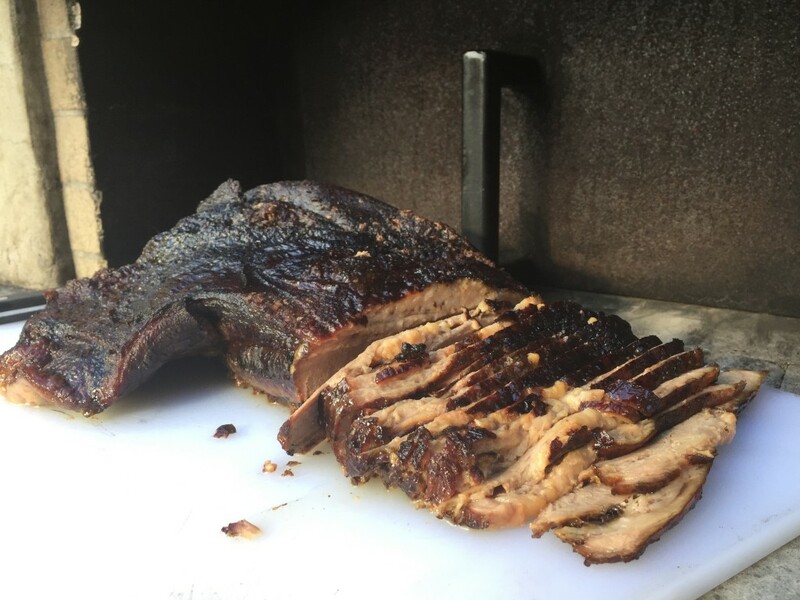 Over the years, we’ve tested several techniques for smoking brisket in a wood-burning oven: using the oven on a down-cycle with intermittent smoky fires, lighting, snuffing, and resuscitating a fire in a cool oven, etc. After listening to a Big Green Egg fan talk about using their egg as a smoker (despite the super limited space) I decided to look at their tips for smoking with a live fire in close proximity to your food. Last night, I tested this technique smoking a brisket. The surprise here is just how little oxygen I needed to keep a fire smoldering. I started out by building a fire and letting it burn long enough to get established. I knew that if I put the door on tightly it would go out. What I wanted was a strong enough fire that when I took the door off and allowed oxygen back in, it would quickly rekindle. I added a bit of extra fuel, with the goal of having enough available fuel to burn for 12 hours without any additions of wood. At first the size of the fire intimidated me, since the one big rule of low and slow is not letting the environment get too hot. This is where the oven provides an advantage over smaller grills. The large thermal mass holds and distributes heat well. The big surprise was how little oxygen it needed to maintain a smolder. I pushed one side of the door flat against the opening and barely pulled the other side off of the face. If anything more than a wisp of smoke escaped through the door, the fire was still burning to hot. This took a little bit of experimentation. You have to look closely in the video to see the wisp of smoke escaping at the right edge of the door. You’ll know that the fire is probably burning too hot if it looks like this when you take off the door. A hot fire will give you a puff of smoke and you’ll see that the fire is actively burning, or immediately flares up to substantial flame. On the other hand, It’s probably just right for low and slow if when you take off the door, you get a puff of smoke but not much of anything else. If you’re looking and see a glow of orange, the fire comes back to life with oxygen flowing in through the open door. When you think about food preparation before gas and electricity, everything was cooked and baked in heat from burning wood—meat, bread, pies, cakes, puddings. 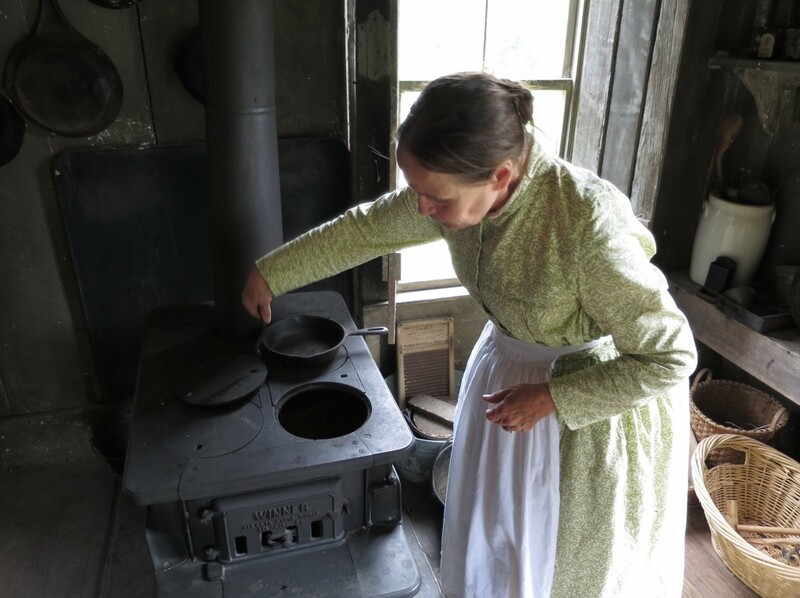 Even after the advent of electricity and gas, many of our great grandparents prepared all their cooked food in wood-burning stoves. The addition of smoke to enhance flavor was not something they had to think about. Today the most commonly smoked foods are meat and fish, followed by peppers, other vegetables, cheese, oils, fruits, syrups, whiskey, beer, and nuts. Check out Dave’s blog and the work he’s done over the years to understand how the old ways work. It may seem disconcerting to hang up a piece of raw meat with nothing but salt to prevent spoilage, but until very recently that is how everyone did it. Salting, brining and smoking were ways people preserved food before electricity and refrigeration. One of the benefits of doing things the old way, besides the pride of ownership, is being able to share the experience with friends. We’re committed to helping you love cooking with wood. This morning at 5:30am there was still a bit of fuel, though most of the wood had burned to ash. There was no visible fire, but after a few breaths of fresh air the fire sprang back to life. The internal oven temperature was just over 200°. This is a technique worth pursuing. One of the best things about cooking low and slow is putting something in the oven before bed and having it ready for breakfast. This 10 hour brisket came out just in time for breakfast.